After my trek to Iowa City last year for SQL Saturday #50, I knew I’d have to travel to more out-of-town SQL Saturdays in the future. Unfortunately I couldn’t make it back to Iowa City this year, but I was very happy when I found I would be able to travel to Kansas City this time around for SQL Saturday #101. This is also the first SQL Saturday I’ve flown to. I like driving, but not quite enough to drive that far! After checking in to our hotel and getting settled, we headed over to Boulevard Brewery for the speaker dinner. I figured this would be the typical brew pub, with large pub in the front and a small brewery in the back. This was more like the exact opposite – a huge brewery (like a full city block) with small bar areas that could be rented out. In addition to great food and what I’m told was excellent beer, they had 2 huge TVs and a projection screen, all tuned to game 7 of the World Series for our viewing pleasure. After a few hours at the speaker dinner, a small but dedicated group of roller coaster enthusiasts consisting of Wendy Pastrick (blog | @wendy_dance), Andre DuBois (@MtnDBA), Jason Horner (blog | @JasonHorner), and yours truly headed to Worlds of Fun, a nearby amusement park, to see how many thrills physics could inflict upon us. Being Halloween weekend, it was their Fright Night event. The place was filled with smoke, appropriately spooky decorations, and numerous haunted areas (not necessarily houses). Our original plan was just to stick to the roller coasters, but after a random gouhl gave us a front-of-the-line pass for the haunted areas, we decided to check out the haunted corn maze. Let’s just say that the employees working that area were *very* dedicated to their job of scaring people! 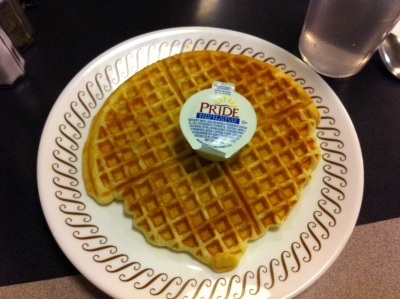 After closing out the park at midnight, we stopped at Waffle House on our way back to the hotel. This was a first for me, as there aren’t any in my neck of the woods. The next morning we headed to the main event, which was held at Cerner Corporation’s Riverport Campus, the same location as last year. 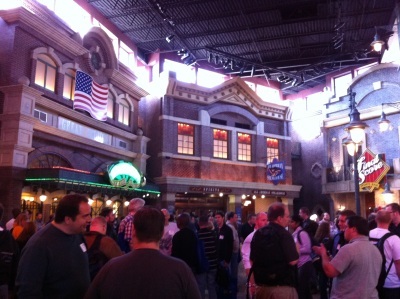 This venue was formerly a casino but has since been turned into a training center for Cerner, a software company. They kept much of the interior looking the same, especially the main atrium. It was quite interesting and definitely the most unique venue I’ve seen for a SQL Saturday so far. Both my presentations seemed to go very well and I’m looking forward to reading reviews from those who attended. My first session was on Backups and Recovery In Depth and was in the first time slot of the morning. I must have done a good job of keeping the audience captivated as nobody fell asleep, though I’m sure my standard practice of having a big bag of candy to throw at people may have helped. I got some really good questions, and some positive feedback from a few people who were kind enough to come up to me afterwards. I thought my second talk entitled The Skinny on Data Compression went even better: I had a smaller crowd but received even more positive comments afterwards. Lunch consisted of a barbecue feast (what else?!?). Choices included bbq brisket and turkey along with awesome sides like baked beans and coleslaw. Of course no account of an SQL Saturday would be complete without mentioning the networking element. The ability to finally meet people in person that I had only known from Twitter is always a highlight for me, and there were plenty in attendance. I’m so grateful I got to meet (in no particular order): John Morehouse (blog | @sqlrus), Danielle Benoit (@_missdani), Bill Graziano (blog | @BillGraziano), Bill Fellows (blog | @billinkc), Mike Fal (blog | @Mike_Fal), Kim Tessereau (blog | @KTessereau), Randy Knight (blog | @Randy_Knight), Stefanie Culley (@StefanieCulley), and Marc Beacom (blog | @MarcBeacom). After a full day of learning, presenting and meeting others, a decent-sized group of us headed to Gordon Biersch restaurant in downtown KC, and spent the rest of the evening exploring the area. We ended up at Kansas City Live!, a large pseudo-outdoor music venue where a Halloween party was taking place. Some danced while the rest of us got plenty of entertainment out of people watching and seeing some of the outrageous cosumes others were wearing. The next day after getting a few (very few, actually) hours of sleep I hitched a ride back to the airport and headed home. 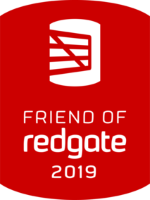 It was an excellent weekend, and I’m very grateful to those who helped make SQL Saturday #101 a great success, both the volunteers and sponsors. Without them, none of this amazing time would have been possible. I’ll look forward to coming back next year! It was great to meet you Glad you could make it down and had a good time. Sounds like you took advantage of your time here! Glad to meet you too, Bill! Yeah I had a great time – hope to see you again next year if not sooner!